The famous watchmaker Ulysse Nardin has released its futuristic model, called Sonata.The model with its design reminiscent of the rapid yachts. The new Sonata watch is available in two versions - in a case of titanium and ceramics or in a case of 18-carat rose gold. The original watch is assembled on the base of an automatic caliber UN-67, to develop of which the brand’s masters have been working for seven years. The caliber has a rotor of 22-carat gold with a silicon escapement. The watch accuracy is ensured by the hairspring, dubbed "Silicon 1.1.1." and an inertial balance of Ulysse Nardin. 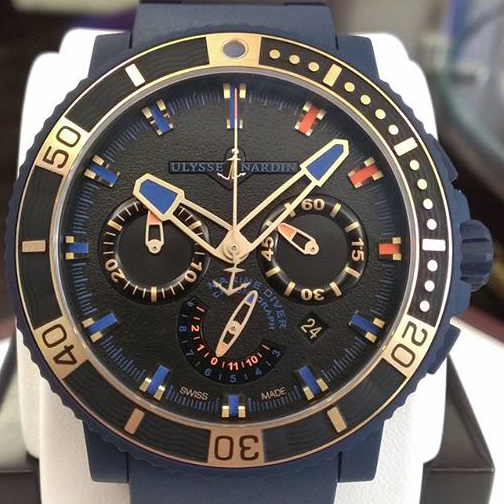 All parts were made by the company Sigatec, which is a part of Ulysse Nardin group. One important feature of the Sonata watch is the alarm clock with cathedral bells. The alarm, built-in mechanism, can be seen in an additional window on the dial, which is set at the 2 o’clock position. Countdown counter, located at the "10 o'clock" position, uses a 24-hour mechanism allowing winding the alarm watch for the day before the desired time. The indicator’s hand moves to the left on a 24-hour scale until the ringing. This makes it possible to see whether the alarm is set for the morning, and the hand at the 9 o’clock position shows if he wound. Another feature of the novelty - the second time zone display with instantaneous adjustment time is a sub-dial, which is available at the 6 o’clock position. Patented indication function of a second time zone makes it possible to change the time using the (+) plus or minus (-). Local time is displayed on the screen, and to set the alarm, date and power reserve is adjusted automatically. Each instance of the Sonata watch comes with a strap in black leather Barenia or a black rubber strap with a folding clasp.